A fellowship-trained aesthetic plastic surgeon in Manhattan, New York City, Dr. Christopher T Chia specializes in surgery of the body and breasts using the most effective, latest techniques available. He is a faculty member of the American Society of Aesthetic Plastic Surgery (ASAPS) and is actively involved in training his peers. 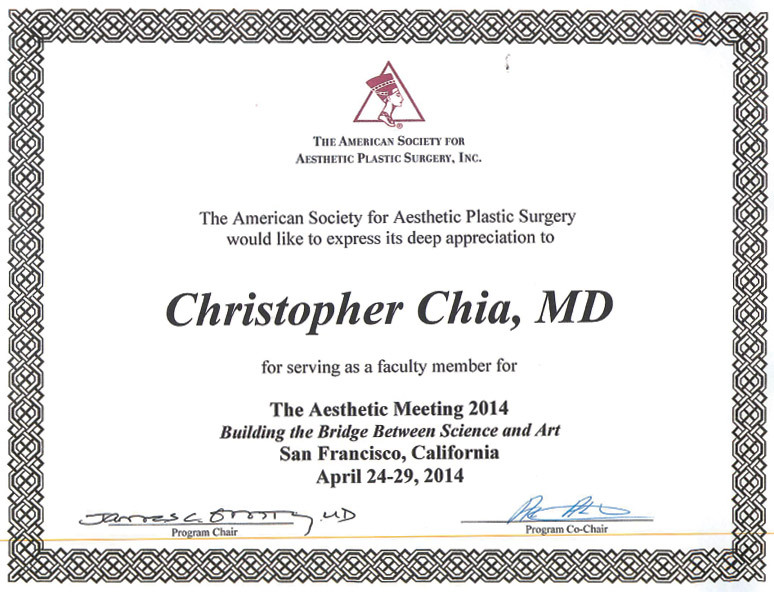 In April 2014, Dr. Chia served as faculty member for the American Society of Aesthetic Plastic Surgery (ASAPS) Aesthetic Meeting held in San Francisco, California. He presented a course on “Liposuction 2014: New Technologies, Established Techniques, and Combined Procedures” that covered a broad range of liposuction from fundamentals to advanced techniques.